Treasure trove of statues forbidden in the Nazi era discovered in the basement of a demolished building was bombed during World War II. German museum officials announced the discovery on Monday (8/11/2010) ago. Mayor of Berlin, Klaus Wowereit, said pleased with the discovery. 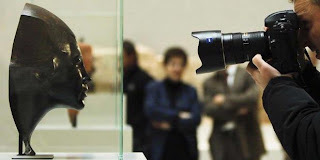 The plan, the sculptures will be exhibited at the Archaeological Museum of Berlin, located only 1 kilometer from the place of discovery. "We should be proud of this invention. Questions about the owner of the statues were relatively unimportant," said Wowereit. Eight of the 11 statues found have been identified as the work of an artist named Otto Baum, Otto Freundlich, Karl Knappe, Marg Moll, Emy Roeder, Edwin Scharff, Gustav Heinrich Wolff, and Naum Slutzky. Meanwhile, three other statues have not been identified. In the Nazi period, this statue is believed to be part of one of the museums in Germany. The statues were then seized and exhibited by the Nazis in Munich and other cities as degenerated art or art that deserves ridicule cheap. Archaeologists discover statues when they were trying to find the remains of collapsed buildings of the 13th century. "When we found him, we thought we had found the remains of the 13th century. However, we found items that this art is called degenerated. Shocked," said Mathias Wemhoff, archaeologist and director of the history museum in Berlin. Experts suspect that the statues are a few things that are saved by Erhard Oewerdieck, a tax inspector who was given the task by the Holocaust museum Yad Vashem for saving Jews during World War II.